In this manuscript, we report the isolation and characterization of two secondary metabolites produced by a Gnomoniopsis castanea strain isolated in the Campania region (Italy) from chestnut galls infested with Dryocosmus kuriphilus. 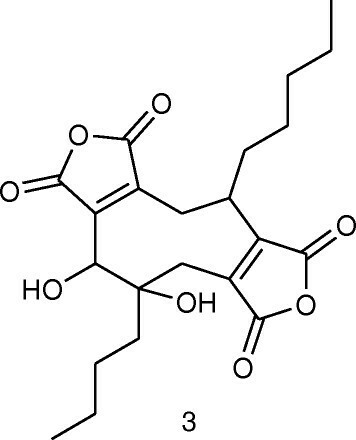 The compounds, purified from the fungal culture filtrate by using preparative HPLC-DAD, showed the same spectroscopic data of abscisic acid and 1′,4′-diol of abscisic acid. Phytotoxic activity of the isolated metabolites on chestnut leaves has been also observed. Many cultivated varieties of chestnut (Castanea spp.) are subjected to severe infestations caused by the chestnut gall wasp Dryocosmus kuriphilus Yasumatsu (Hymenoptera: Cynipidae), which can disrupt the fruiting process and reduce a tree's yield by up to 70%. In addition to pest infestation, necrotic symptoms on leaves and galls are often observed due to the development of a gall colonizer identified as the fungus Gnomoniopsis sp. . The new species Gnomoniopsis castanea has been recently described, based on the association with Castanea sativa, the morphology and the phylogenetic analysis of the internal transcribed spacer (ITS) regions of ribosomal DNA and the EF1-a locus. The fungus has been associated with nut rot and caused disease symptoms when artificially inoculated on fruits or flowers . Many fungi exert their effects on plant synthesizing secondary metabolites that alone reproduce some or even all of the symptoms of the disease caused by the producer organism. Moreover, some fungi interfere with the physiology of the plants by producing hormones, such as gibberellin, gibberellic acid, or indole-3-acetic acid . Here, we report the isolation and characterization of the major secondary metabolites produced in liquid culture by a Gnomoniopsis strain isolated in the Campania region (Italy) from chestnut galls infested with D. kuriphilus. Sequence analysis of the ITS rDNA region indicated 99% similarity with GenBank sequences of G. castanea confirming the identity of this species characterized as the main causal agent of rot of the ripe nuts, both before and after picking . In order to isolate the major secondary metabolites, ten 7-mm-diameter plugs of G. castanea, obtained from actively growing margins of PDA cultures, were inoculated into 5-L conical flasks containing 1 L of sterile potato dextrose broth (PDB). The stationary cultures were incubated for 21 days at 25°C. The cultures (6 L) were filtered under vacuum through a filter paper, acidified to pH 4 with 5 M HCl, and extracted exhaustively with ethyl acetate. The combined organic fraction was dried (Na2SO4) and evaporated in vacuo at 35°C. The red residue recovered (430 mg) was subjected to flash column chromatography (silica gel) with gradient elution (petrol/ethyl acetate), which resulted in four distinct fractions. Fraction 1 gave a mixture of fatty acids (40 mg), while fractions 3 and 4 (80 mg) were further purified by preparative HPLC-DAD to afford 10 mg of abscisic acid (ABA; Figure 1) and 6 mg of its precursor, 1′,4′-trans-diol ABA (diol ABA; Figure 1). The compounds (only released in culture filtrates, while absent in the mycelium extract) were characterized by spectroscopic methods, including UV, LC-MS/MS (Figure 2), and 1D and 2D NMR analyses, and showed the same data of those given in the literature for ABA  and its diol derivative . (+)ABA 1 and 1′,4-′ trans -diol (+)ABA 2. Mass spectra of (+)ABA 1 and 1′,4′- trans -diol (+)ABA 2. (A) Mass spectrum of (+)ABA 1 - [M + Na]+ = 287.24, [MH-H2O]+ = 247.19, [M2 + H]+ = 529.32, [M2 + Na]+ = 551.26, [M2 + K]+ = 567.30. (B) Mass spectrum of 1′,4′-trans-diol (+)ABA 2 - [M + Na]+ = 289.30, [M2 + Na]+ = 555.37. The phytotoxic activity of the isolated metabolites was also tested. A fresh chestnut leaf was inserted into an aqueous solution of (+)ABA or diol (+)ABA at 100, 10, 1, 0.1, 0.01, and 0.001 ppm and compared with controls. The phytotoxic activity was monitored on the leaves by measuring the necrotic and/or chlorotic area formed at room temperature. Phytotoxic activity on chestnut leaves was observed at 1, 10, and 100 ppm (Figure 3) 48 h after treatment, while no toxic activity was registered at lower concentrations. 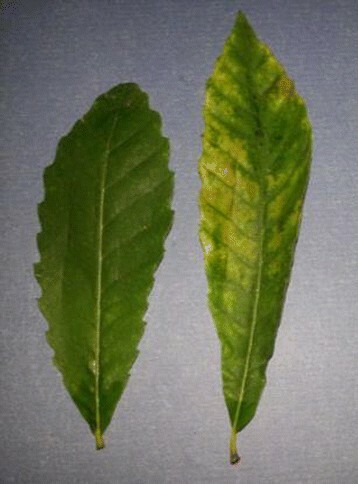 Phytotoxic effect of (+)ABA at concentration of 0.1 μg/ml (right) compared with control (left). Hormones or hormone-like molecules typically have an optimum activity in terms of plant growth regulation between 10−5 and 10−6 M while having a toxic effect at higher concentrations . Some phytopathogenic fungi like Cercospora spp., Botrytis cinerea, Rhizoctonia solani, Fusarium oxysporum, Ceratocystis coerulescens produce (+)ABA and its biosynthetic analogs . Interestingly, Macrophoma castaneicola, a pathogen causing chestnut black root rot disease, produce two main toxic metabolites on chestnut leaves identified as castaneiolide (Figure 4) and (+)ABA (Figure 1) . ABA has been considered a negative regulator of disease resistance. This effect is due to the interference of ABA with biotic stress signalling that is regulated by salicylic acid, jasmonic acid, and ethylene, and to an additional effect on shared components of stress signalling . The production of ABA by fungi may interfere with the normal physiology of the plant and could explain why phytopathogens secrete this metabolite to plants exogenously. All authors have contributed substantially to the work. FV drafted the manuscript; FV, GM, PM, AP, FS, SC: isolation and characterization of metabolites; MR, EG, UB: growth and fungal isolation; SW, ML: biological characterization. They read and approved the final manuscript.